Welcome to the newest Mercedes-Benz CLS. And, for the first time comes with mild hybrid power that will be sold as a coupé only, losing the CLS Shooting Brake Estate. The CLS slots in nicely below its S-Class siblings, offering a luxurious, low-slung four-door coupé to rival that of the Audi A7, Porsche Panamera and BMW's 6 Series Gran Coupé. And it cost less than an S-Class too. Although priced from an estimated £57,000, it's still an expensive choice but one that shouldn't be a major concern for buyers in this market. Based on the latest E-Class, the vehicle is bigger all round to the one it replaces. This includes more space between its front and rear axles, resulting in more rear legroom and better access to the rear seats. Moving inside and, once again with the latest E-Class acting as a donor, the interior of the CLS is very familiar. The gorgeous new widescreen cockpit display is the main attraction – made up of two 12.3in screens, the central screen is given over to infotainment and navigation while the right acts as a virtual instrument cluster. In its standard spec, though, the CLS comes with only one 12.3in screen for infotainment. The new multi-function steering wheel is taken from the S-Class, including those touch-sensitive pads that control the COMAND infotainment system. In an interesting move, there is now a third rear seat so, for the first time, the CLS is not only a 2+2 and can now carry five people. Boot space remains 520 litres and can comfortably swallow a couple of travel suitcases without any trouble. Mercedes have launched with three engines to choose from, with most buyers likely to head straight for the entry-level 350d, the same diesel engine most recommend in the current model. Producing 282bhp, this diesel model will get to 62mph from zero in 5.7 seconds. Official fuel economy is rated at 50.4mpg, with CO2 emissions of 148g/km. The 400d diesel delivers a faster 0-62mph sprint time due to the 335bhp on tap with – if you can believe – no drop in fuel economy or CO2 emissions. For now, the only petrol option at launch is the 450. It's a 3.0-litre hybrid petrol/electric power source, with a combined 384bhp. 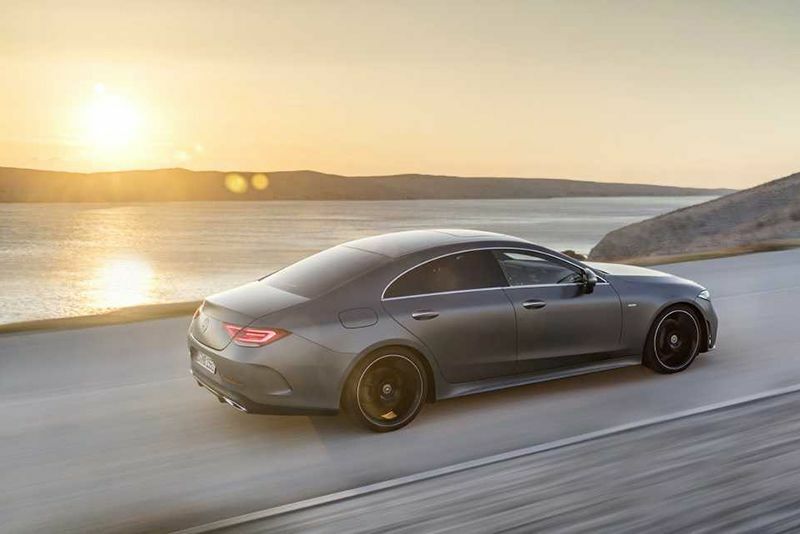 Which translates to 0-62mph in just 4.8 seconds – officially the fastest CLS for now. As always, Mercedes-AMG – the performance division of Mercedes – is planning a hot version of the CLS which will carry the moniker CLS53. We're expecting January's Detroit motor show to reveal more, although it's rumoured to feature a mild hybrid powertrain with as much as 450bhp. There will be more engine options down the line too, including the 350 petrol and 300d diesel. The initial offerings of the CLS will come with four-wheel drive as standard. Different specification levels will include different standard equipment, but all models are expected to include heated leather seats, leather trim and sat-nav. Safety kit includes automatic emergency braking, lane-keeping assistance and a driver drowsiness monitor. Mercedes' usual array of convenience systems on the options list, including adaptive cruise control and blind spot monitoring among others. The CLS is estimated to start at £57,000, which is considerably more expensive than the current model but, once the cheaper four-cylinder version goes on sale soon after the initial launch, that price should come down a smidge. With that said, the Mercedes-Benz CLS still comes in at a substantially lower price-point to its rivals from BMW, Audi and Porsche. And that is something!